Aloha Hawaii! 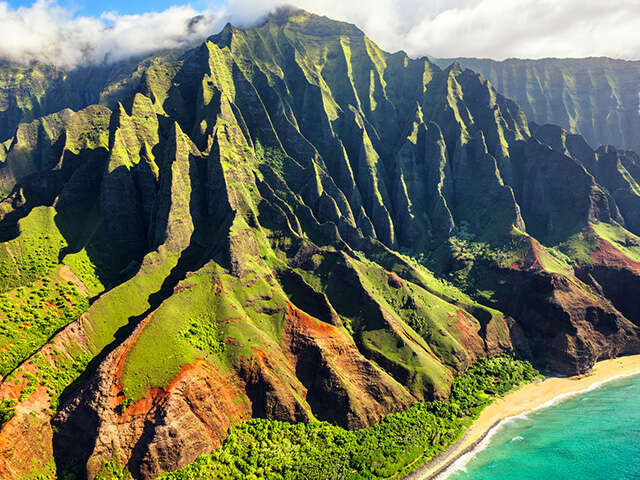 Pristine beaches, active volcanoes, quaint towns… Hawaii seems to have it all. So where to begin exploring this series of islands? What makes each island different? Whether you want to island hop or stick to one island only, a look at some of Hawaii’s highlights will certainly help. Here is a look at some of the best ofs on 4 of the main Hawaiian Islands. Hanapepe: When visiting the oldest of the Hawaiian Islands, it’s only fitting to explore its history and culture – both present in the small town of Hanapepe. Historic plantation-style buildings, shops and art galleries abound here. The town’s charm is so palpable that it is often used as the setting for Hollywood films, like Lilo and Stitch and The Thornbirds. Old Koloa Town is another must-see for history buffs; this town helped shape the sugar cane industry in the 1800s. It’s accessible via the Maluhia Road Tree Tunnel, a stretch of road lined with eucalyptus trees that were planted over a century ago. The great outdoors: Kauai, deeply rooted in the environment, has outdoor spots that beg to be explored as well. In addition to hitting up Kauai’s beaches, you can visit remote waterfalls and kayak along the Wailua River, hike through the Waimea Canyon and cruise along the scenic Napali Coast. Surfing: Located on Honolulu’s south shore, Waikiki Beach’s calm waters set the tone for a first-time surfing lesson. The North Shore’s bigger waves are perfect for more seasoned surfers. Pearl Harbor: The 1941 attack on Pearl Harbor by the Empire of Japan is what brought the United States into World War II. This US naval base is now a designated National Historic Landmark with a total of 5 memorial sites. Leahi Peak (Diamond Head): If hiking and taking in coastal views are on your Hawaii to dos, then reaching the top of Leahi Peak is a great way to get the best of both worlds. Waikiki and Honoluluare visible from here. Lahaina: Hawaii regional cuisine is the pièce de resistance in Lahaina, a Maui hotspot. Known as farm-to-table cuisine, this type of fare combines local specialties like seafood with international influences. This town is also a great place to witness a luau, a traditional Hawaiian feast with eating, drinking and Polynesian dancing. Kula: Many of the ingredients used in Hawaii regional cuisine come from the produce farms of Kula. Besides taking a farm tour, you can also visit the Kula Botanical Gardens. Natural beauty: Maui’s food is not its only highlight – there are lots of natural sights to take in too. Head to Iao Valley State Park to see the famed Iao Needle, a protruding green-mantled volcanic rock that looks like, you guessed it – a needle. Haleakala National Park, with its numerous hiking trails, is also an ideal location to see natural wonders like the Nene, an endangered species of Hawaiian goose. Hawaii Volcanoes National Park definitely deserves a visit if you’re heading to the Big Island. It is home to 2 volcanoes: Maunaloa and Kilauea, one of the most active volcanoes in the world. In addition to hiking volcanic craters, you can visit the on-site museum or snap photos of some petroglyphs (lava rock carvings). Sailing the Kona Coast: Several boat tours depart from Historic Kailua Village and Hilo. Diving with manta rays, whale watching, scuba diving and fishing excursions are also possible from Honokohau Harbor and Kawaihae Harbor. Horseback riding in Waimea: Experience the paniolo (Hawaiian cowboy) lifestyle by horseback riding through Waimea. Head along the waterfall trails of Waipio Valley or make your way towards Kealakekua Bay to cap off your day with a quick swim.